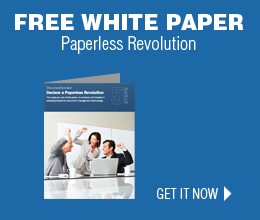 Scan paper documents into full-text searchable, paperless digital files. Convert paper documents to digital and store them in the document management system using document scanning tools in Document Locator. Document scanning provides an end-to-end approach for information management, from paper to paperless. Once scanned into the system, files can be searched and found instantly. Optical character recognition (OCR) technology and full-text indexing means documents can be searched based on words or phrases within the content of the files. Everything is saved in secure repositories. Once in the system, files can be held in digital storage, routed in workflows, placed under records policies, and more. You can scan new documents as they arrive, or complete a full backfile scanning project and eliminate existing filing cabinets and document storage. Paper documents, images, drawings - virtually anything on paper can be scanned as digital files. Electronic files take up less space, accelerate business processes, are more secure, and are easier to recover for business continuity. As documents are scanned into the system, facts about the files can be captured as important document metadata values. This profiling of information allows documents to be sorted, organized, classified, and searched even faster. Metadata can be captured from zones, barcodes, coversheets, or selected individually on the screen using the side by side preview in the Document Profiler tool. Document Locator offers several optional scanning capabilities, and at the core is the optional Scan Station. This scanning component is designed to support everyday batch scanning with the Document Locator desktop client. The document scanning components work with any TWAIN-compliant scanner or networked digital Multi-function Printer (MFP). All scanned documents, and associated metadata, are kept in a secure repository. Documents can be scanned ad-hoc one at a time, by the hundreds, or in an automated way using scanning templates, coversheets, and barcodes. Previously scanned documents and existing digital files can be imported without the need to re-scan files. The Scan Station includes scanner control and allows for importing of scanned document images in bitmap, GIF, JPEG, PDF, TIFF, and TIFF (OCR) file types. Both manual scanning and scanning templates (used for automating standard scanning jobs) are possible. Features include the ability to use cover sheets (or standardized forms), and ability to capture data using zonal OCR (a type of Optical Character Recognition that reads specific zones to capture information from a location on a document). An optional addition to the Scan Station module is the SmartBatch feature which enhances Scan Station coversheet and form recognition. 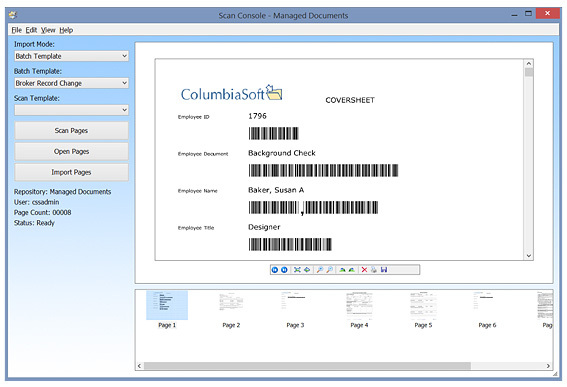 Using SmartBatch, the Scan Station can be configured to import multiple documents with different coversheets (or standardized forms) in a single combined batch scanning run. SmartBatch automatically recognizes the different documents and applies the correct batch template, indexing, and storing procedure to the documents. Another optional addition to the SmartBatch feature is the optional Barcode recognition component. Barcodes are a standardized method that ensures extremely high accuracy. Writes more than 30 linear barcode types in bitmap and PDF, in vector or raster format. Recognizes linear barcodes (including Patch Code) in more than 90 different image formats including PDF. Recognizes barcodes' orientation from 0° to 360°. Detects nearly 20 industrial 1D barcode types. Detects barcode on a full page or on a region of interest. Recognizes and generates DataMatrix (DM) barcodes in more than 90 different image formats, including PDF. Detects multiple DM barcodes from black & white, grayscale, palettized and color images. Detects DM barcode on a full page or on a region of interest. Recognize and generate PDF417 barcodes in more than 90 different image formats, including PDF. Recognize QR-Code and Micro QR-Code in more than 90 different image formats, including PDF. Read multiple QR-Code barcodes from black & white, grayscale, paletized and color images. Read QR-Code barcode on a full page or on a region of interest. Watch a document scanning video.